For thousands of years humans have engaged in making visual records of the world around them. From the earliest Ice Age animal cave paintings to birthday photos of our children, a common value seems to be expressing itself through our ever evolving technologies and skills that create “visual likeness.” Charcoal, ink, dye, pigments — these were the earliest materials. But it was the technological innovation of the camera and light-sensitive materials over 170 years ago that truly changed the game and the trajectory. Consumer digital imaging sensors are only a few decades old by comparison. It is truly a remarkable history, if you think about it, from Lascaux to the iPhone. But startling new technologies are poised to change the idea of capture and camera yet again. A long list of recent innovations are contending to lead the upset too: wearable cameras, VR & 360 cameras, contact lens cameras,computational photography, no lens or no shutter cameras, semantic cameras, light field imaging, a fusion of contextual sensors that provide ambient intelligence, flexible sheet cameras, even scentography. Whichever technologies take the lead, it is clear that we are moving away from a picture taking device that merely records “visual likeness” to a data collecting device (or material) that will capture the rich sensorium of perceptual cues manifest within our experience. We are rapidly moving beyond the visual alone, which means the convention of the camera itself must change. Technology is imitating life! Matt Hackett’s eloquent post As We Become Cameras: wearable cameras will be ubiquitous— describes a future that may evolve where a mode for capturing the world around us will be “always-on.” A network connected, physically unlimited camera, will be as normal as wearing a watch. 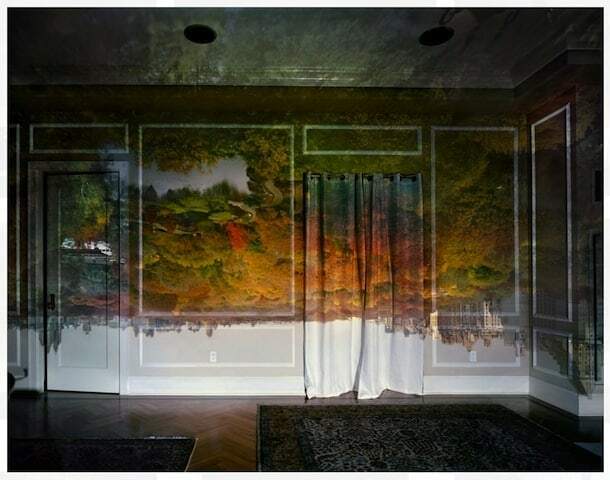 The earliest experiments in 19th C photography utilized the camera obscura, an image forming “dark room or chamber” to coax likeness into being — see the lovely camera obscura photo by Abelardo Morell at the top of the post. But imagine a future time when the rest of the sensate, personal and social world is experienced with his image, where you can feel and hear the cool, fresh autumn breeze in Central Park, the changing point of view as you move around the space, the meaning of the experience, real-time users joining your experience, or the nodes in your social network that overlap in both time and space. When photos will no longer be things, but experiences, as photojournalist and entrepreneur Stephen Mayes writes about, we will have a different medium entirely. The Camera of the Future? Perhaps it will be no camera at all. A future experiencing modality will require that we are free of the idea of a camera. We already have a full array of data sensors that parallel human sense perceptions for contextual, positional, ambient, semantic and bio data, albeit some still at the developmental stage of “charcoal.” Will they be packed into a mobile device? Or will something completely new emerge from another discipline, unconstrained by current form factor thinking? In 1969, Willard Boyle and George E. Smith entered a note in their research lab book for a Charge Bubble Device that was to become the foundation technology Michael Tompsett built on for the first CCD patent in 1971. It was researchers at Bell Labs working in telephony that propelled imaging CCD sensors into the world. They, and their colleagues, were the prime movers for the imaging explosion we are now experiencing. Game changing inventions often happen just like that, where “chance favors prepared minds” to see the possibilities outside of the core quest. Advances in sensors across the board will create a new balance with the visual. The camera of the future, well, it just can’t be a camera. So, it makes me wonder which research labs, unfettered by camera or conventional digital imaging tech are now poised to discover the super power of unbounded experiencing? Personally I would like a nano-particle ubiquitous experience capture cream or filament, rubbed onto skin or woven into clothes. Wherever I am, my experience capture technology would always be there too, fully integrated into my reality — just like consciousness and time. Donna Romer is founder and ceo of Yarn. She has 20-plus years of experience in executive leadership, having both founded and operated innovative businesses, where she consistently produced award-winning commercial software products and services in the digital visual media industry. She has been an avid developer of business-driven technology throughout her career. She also served as the Chief Technology Officer and Senior Vice President for two digital asset management companies, eMotion, Inc., and Picture Network International, where she provided executive and operational leadership. She served technology executive positions at Eastman Kodak Company namely in the Entertainment Imaging Division. She serves as a Member of Advisory Board at Infratrac, Inc and of Digital Railroad, Inc.